The Dining Out Team had an overseas visitor with us and we thought hard as where he could be taken. Many great restaurants reviewed recently, but European cuisine in the main. Where could we take a European visitor to experience some genuine Thai food, with a restaurateur willing to explain everything? In the end, it was simple – Somsakdi Restaurant, run by Somsakdi Kavowthong, who will admit to being 75, but he is a very sprightly 75, still with his trademark towel over his left shoulder. If any restaurant in Pattaya deserves to be called an icon, it is Somsakdi, in Soi 1 Beach Road, having been there for 28 years, 19 on the right hand side and nine on the left and about three quarters of the way up the soi. Enormous high ceilings keep the temperature under control, and there are many, many tables, which began to fill up during our meal. The Dining Out Team was not the only people to know about Somsakdi Restaurant. When you enter, you will see a smiling chap in a colored shirt and a napkin over his left shoulder. This is Somsakdi, who never seems to age, and who has been running his own restaurant here in Pattaya for almost 30 years. Somsakdi really is one of the success stories of Pattaya, but the road to the top was not an easy one. He was once a delivery boy for Pepsi-Cola, for a monthly salary of 450 baht. At that time he also decided that, “One day I have to be boss, not just a worker.” A turning point was to come in his life after just a few months of pushing Pepsi wheel barrows. He met famous restaurateur Dolf Riks, who advised him that if he were to achieve his aim, he should go to the kitchens. This he did, and traveled the world in sea-going galleys, bringing back not postcards, but recipes from different parts of the world. 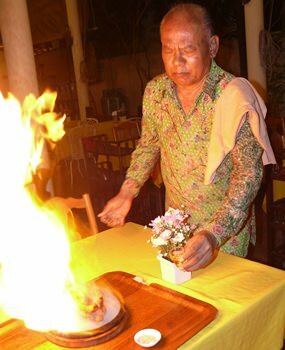 He worked with famous cooks such as Moogens Bay Esbensen, at the renowned Two Vikings Restaurant in Bangkok. 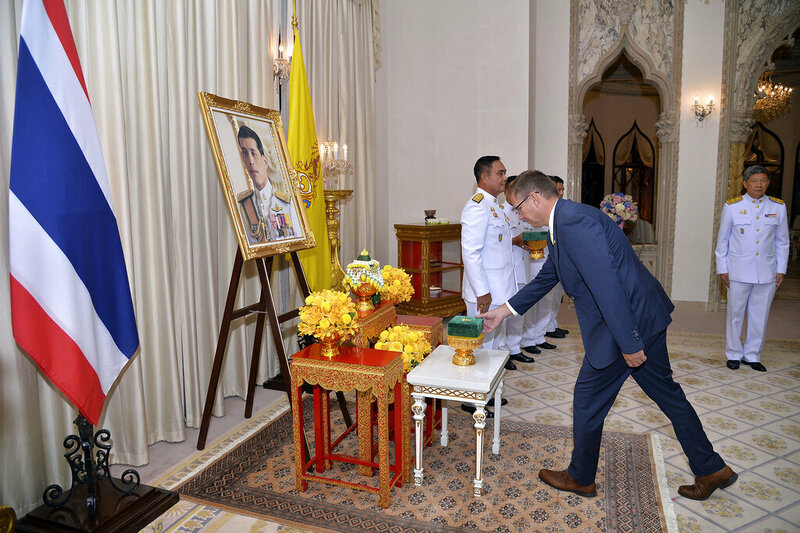 Finally he came to Pattaya and worked with Dolf Riks, his advisor from so many years before and then opened his own restaurant, simply called “Somsak’s” to be later called “Somsakdi’s”. The venue is enormous, and because of its capacity has always been very popular with large groups. The very reasonably priced dishes are also an attraction! Not only is the venue enormous, but so is the menu as well! Pages and pages in both Thai and English, with items covering Thai food, European food, Chinese and vegetarian cuisine. “Three hundred and seventy four,” said Somsakdi with pride. To help us with the menu, we ordered Heineken beer which at B. 60 is a bargain in a restaurant these days. Appetizers are in the B. 150-200 range. Seafood dishes are B. 250-500 and he even has fried kippers, a perennial European favorite. Thai dishes are mainly under B. 200. Somsak is very proud of the fact that he was the one who brought deep-fried ice cream to Pattaya from New York, many years ago. Our guest mentioned that he likes deep-fried ice cream, and after a short discourse on how it should be done, he returned with the (almost compulsory) dessert. And it was beautiful. 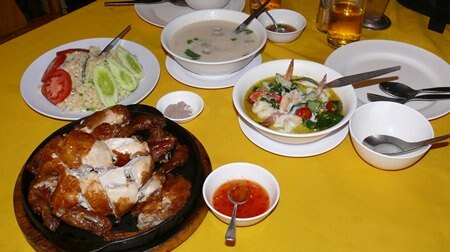 We had a selection of dishes from the 374, and when Somsakdi suggested some we were happy to listen to the restaurateur. His/our selection included Hoi Jaw deep-fried crab and pork (B. 250), spring rolls (B. 170), a Tom Kha Gai, the Gai Sawan (flamed chicken on a hot plate), Green curry and a fried rice (B. 200). Quite frankly, the food was delicious, with the flaming chicken, the Tom Kha Gai and the Green curry being stand-out dishes. 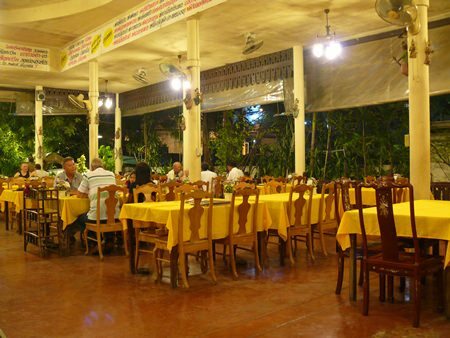 We can highly recommend Somsakdi Restaurant, and is certainly a venue to take your overseas visitors for a great and inexpensive evening. Out of 374 items, even the pickiest of eaters will find something they will enjoy. 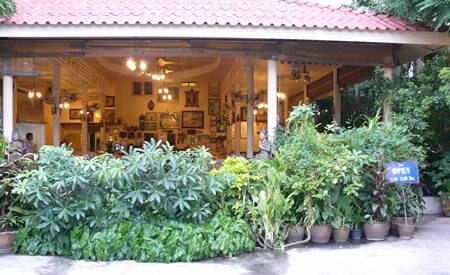 Somsakdi Restaurant, Pattaya Soi 1, tel: 038 428 987, 038 423 284, 038 429 869, limited parking but plenty of on-street parking in the soi. Hours 11 a.m. until 11 p.m.